How does skin spa sounds like to you before/after this week? I guess it will be tiring for some people as there will be nonstop of attending parties/events/gatherings which doesn't only make your body tired, but your face and skin will show tiredness as well. 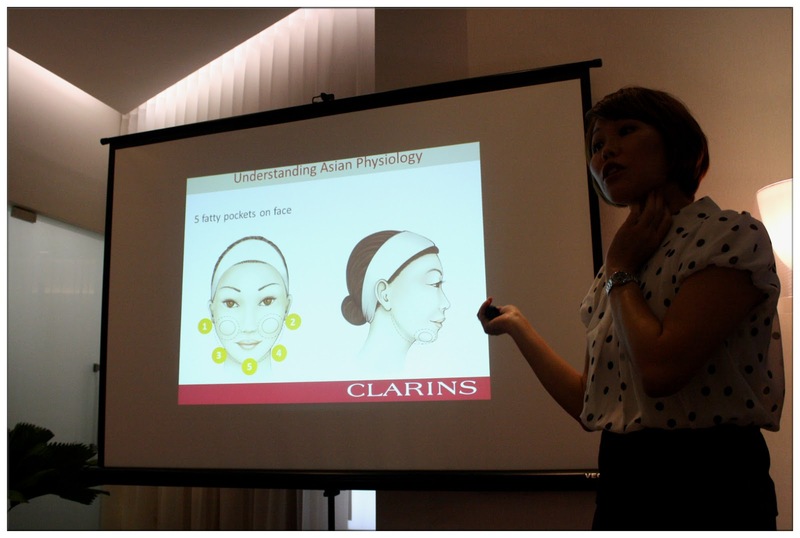 Thanks to Tammy, WEVents and CLARINS, I got to attend CLARINS V Contour Beauty Workshop for bloggers and seriously, it is such an eye opener of what CLARINS has to offer their clients and I've learned some of the CLARINS 'secret' which I wanna share with you. This is the biggest spa centre of CLARINS in Klang Valley, just recently revamped! 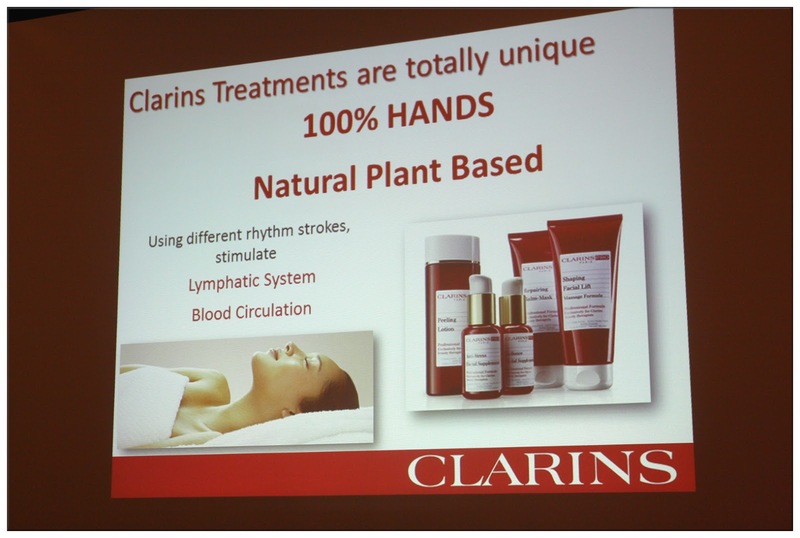 This is my first time been to CLARINS skin spa. Products from CLARINS which some of them were used during the workshop. I'm amazed by the immediate results. 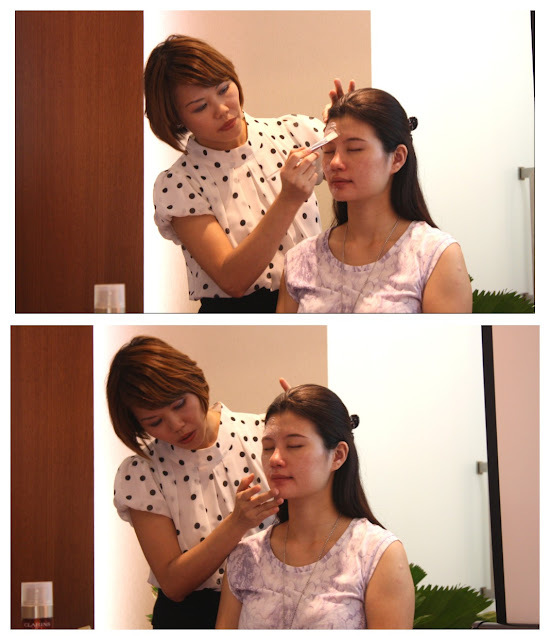 Winnie Lai will be demonstrate to us how to achieve V Shape face a.k.a kuaci face in this workshop. 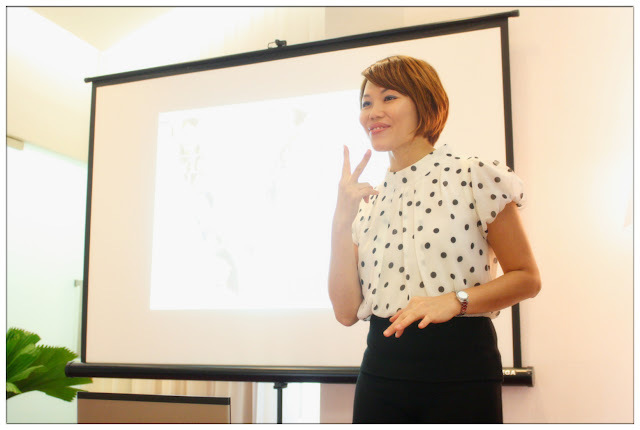 Winnie is the professional trainer at CLARINS who provides training to all the therapists. 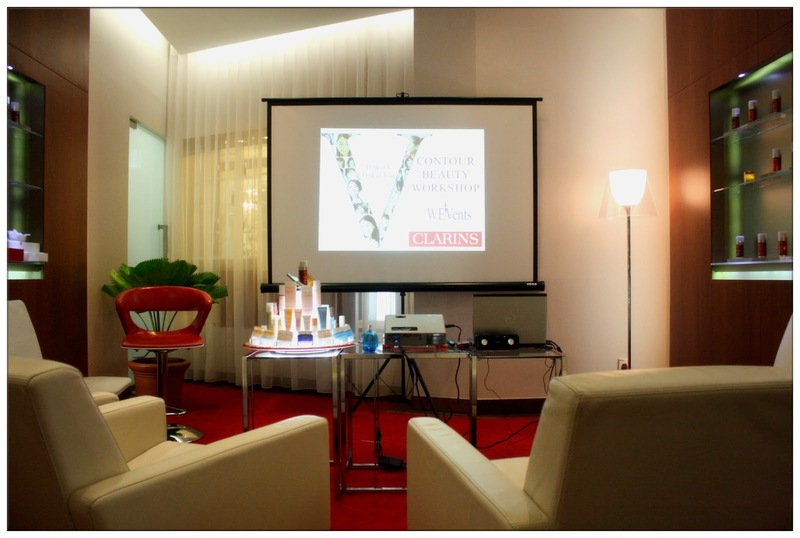 After some light refreshments, there starts our V Contour beauty workshop. 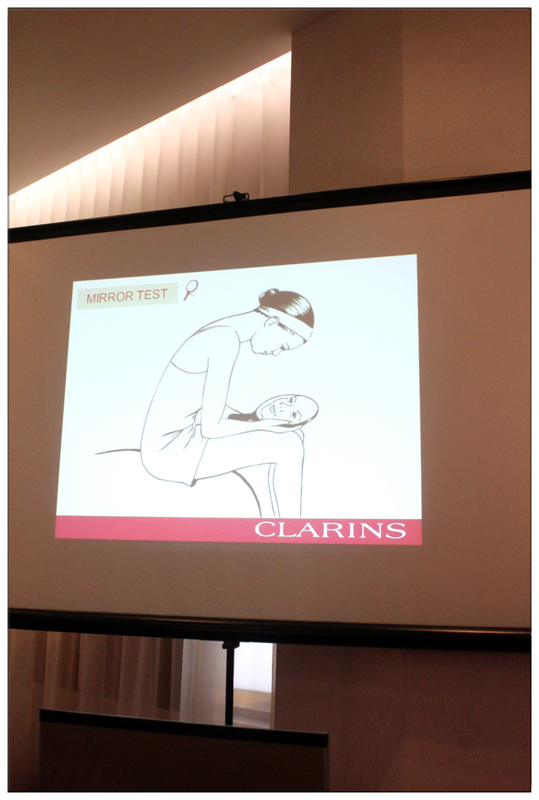 First and foremost, CLARINS has prepared each and one of us a mirror to do a mirror test. This will be the 照妖镜 (magic mirror) which reflects the true face of the 妖 monster (me). LOL! This is how mirror test look like. If you really, really wanna know how you'll look like for the next 5 or 10 years, this is one test you should do and you can immediately see the results reflected on the mirror. No need for any special application on computer or photoshop, just put the mirror on your lap, look down in it, and you'll see. My oh my, the gravity on earth will just take any beauty away, that's why we girls need to be more and more hardworking in taking care of our skin, especially if you reach age 25 and above (like me T_T), you can only try your best to preserve your current beauty by choosing your skincare products carefully. 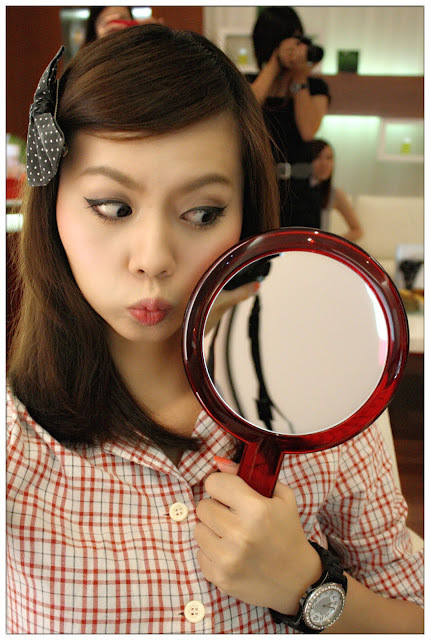 If your skincare has face lift function like CLARINS', which can defy gravity, this is how you should look at the mirror in a mirror test, the result after using the face and shape lifting products. Seriously, being Asian got a lot of downsides, mono eyelids for some, low nose bridge, small eyes, round face shape for most of us and yet, another major downside for Asians physiology is the five large fatty pockets on our face. Seriously FOL. If you wonder why our faces are usually fatter than caucasians, it is because of these. Because we're don't have nice face shape naturally like caucasians do, that's why we need to be more cautious about the force we pressure on our face when we apply skincare products. First and foremost, start with a clean face. 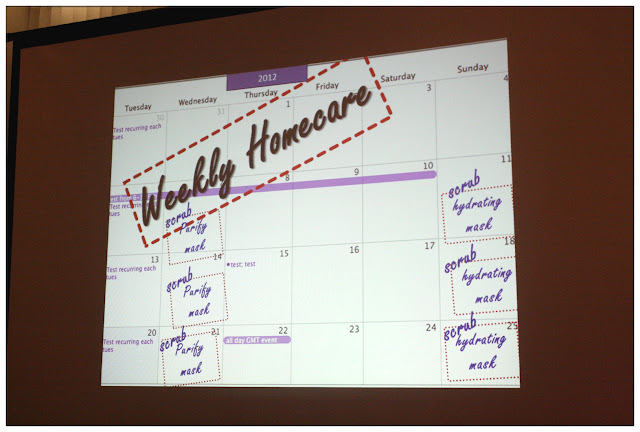 Rane as the demo model of the workshop. Winnie cleansed her face using Cleansing Water by CLARINS. Keep in mind that this is the routine we should practise. 2 times scrub + mask in a week. Applying CLARINS Gentle Refiner on Rane's one side of face. 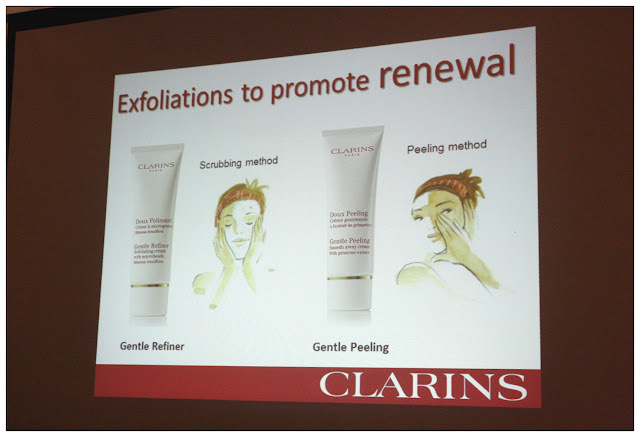 There's another exfoliation product by CLARINS which using the peeling method called Gentle Peeling if you dislike scrubbing method. I personally like scrubbing method more. 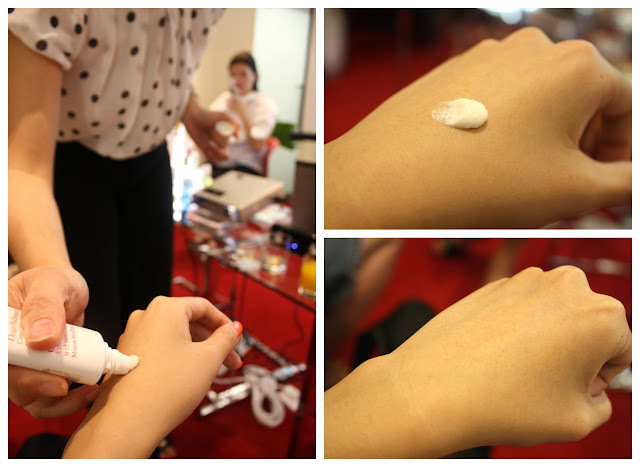 Winnie let us try the Gentle Refiner on our hand to feel the micro beads and how radiant our hand's skin feels after the scrub was done. Exfoliations done, can feel the skin become softer and brighter after. Too bad can't tell through the photos + yellow lighting. 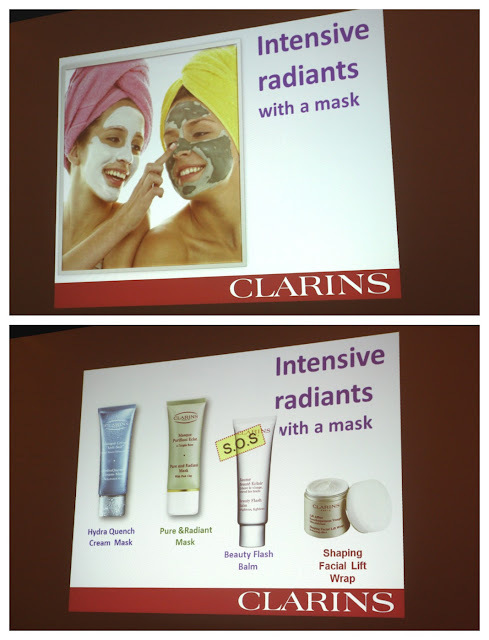 CLARINS have 4 types of mask, and the Beauty Flash Balm is perfect to brighten up your face immediately after the mask! S.O.S for dull and tired skin? Try that! Today is the V Contour Beauty Workshop, hence we didn't try the Beauty Flash Balm and tried the Shaping Facial Lift Wrap instead. We all want to see how good is the effect of Kuaci face after apply the mask. 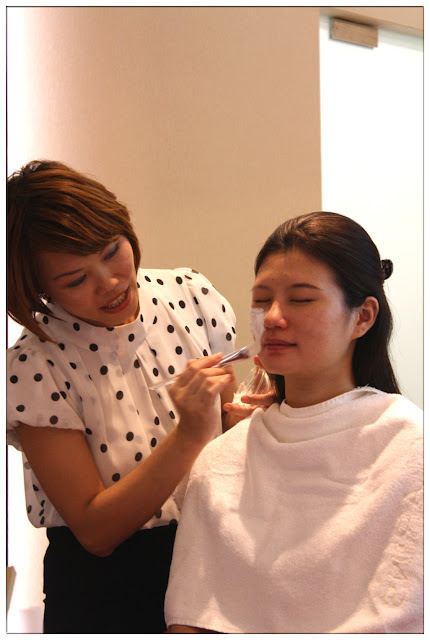 Gently apply Shaping Facial Lift Wrap around the cheek and neck area. Avoid forehead and nose area ya. 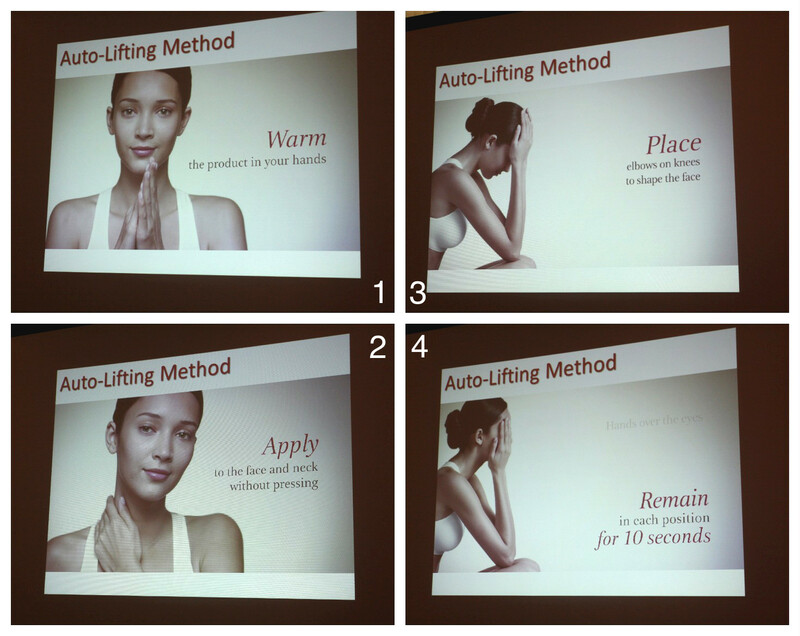 Yay~ We get to try the Shaping Facial Lift Wrap too! Since most of us have foundations/BB cream on our face, so we just apply the mask at our jawline area, I want to have kuaci face really really bad!!! If you're using Shaping Facial Lift Wrap at home, don't ever forget to apply the mask around your jawline and neck area ok? Mask done! Got V Shape or not? I really think it works, for just about 5 minutes of wait. 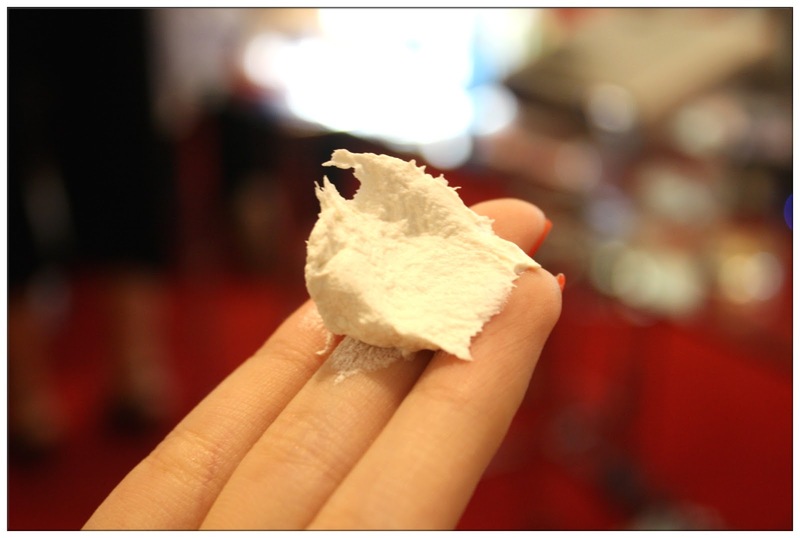 Its texture is more to rice-cream mousse and there are Chinese Barley and organic Gingko biloba as ingredients in the Shaping Facial Lift Wrap mask. 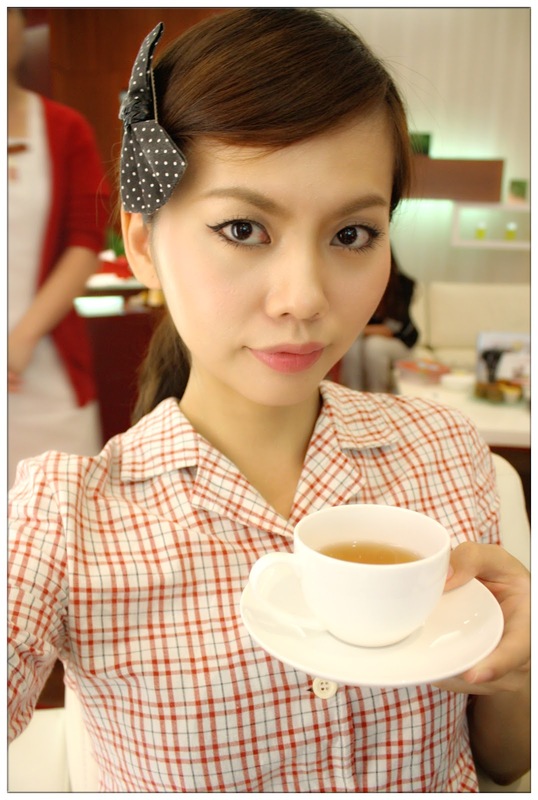 It is a quick-fix to counter face puffiness due to lack of sleep, stress or heat. 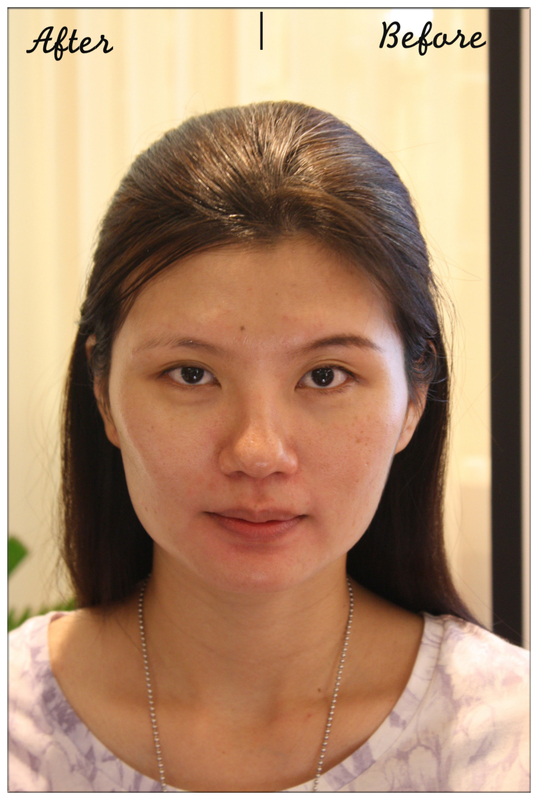 After applied, I can feel the heat and tightening around my jawline area which is good as it is actually increasing blood circulation around the area, and after that, can see that my jawline was more contoured than before. 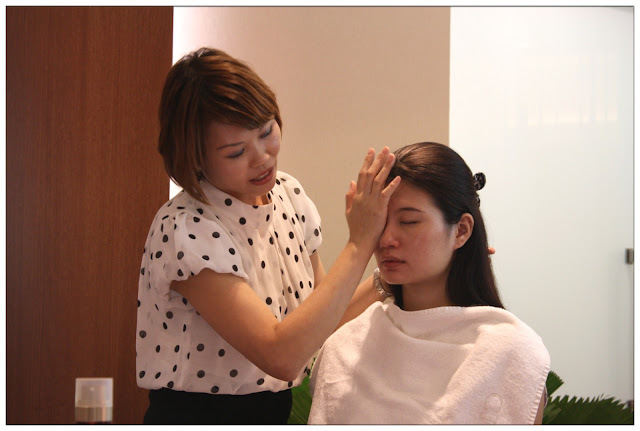 After applying mask, it is time to apply skincare products to protect our skin from outside. Yes, double FOL that not only our face have fatty pockets, our eyes have SIX fatty pockets as well. That's why eye puffiness and swollen are one of the major issue for some people. 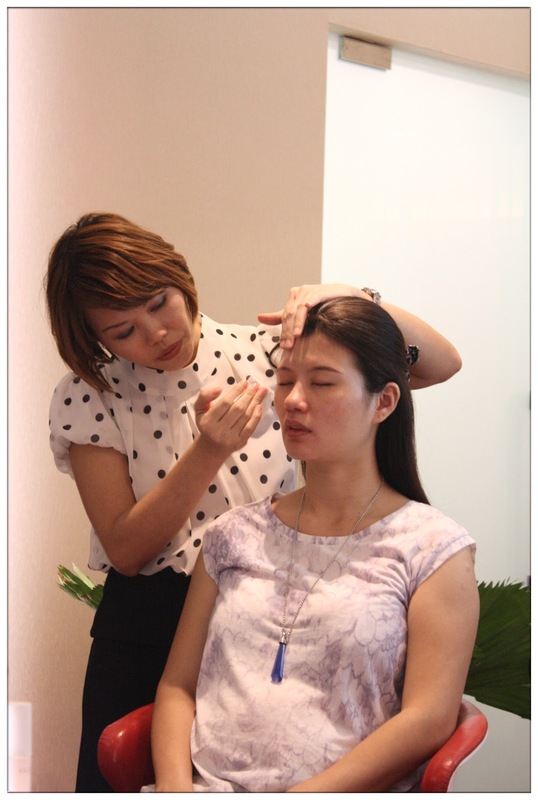 Defining Eye Lift, as what you see in the name - Lift, Contour, Refine, is the function of this eye care product. It gently tighten skins and reducing lines around the eye areas for a more youthful look. This eye cream also improves blood circulation and skin hydration to reduce dark circles. It also stimulates lymphatic circulation which prevents further formation of dark circles and prevent puffiness, giving you a pair of luminous, brighter-looking eyes. 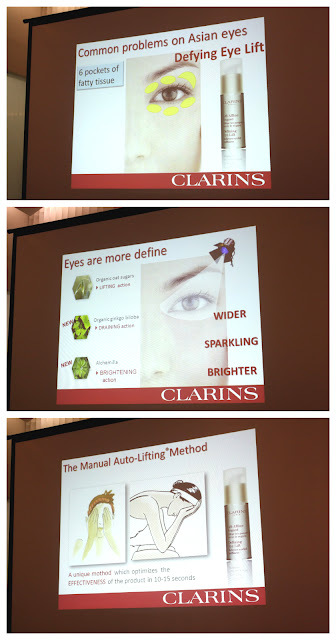 Using CLARINS Defining Eye Lift with an unique application method - Manual Auto-Lifting Method by CLARINS. The force we pressure on our skin when we apply skincare products can actually stimulate lymphatic circulation, which helps to clear out dirts in those lymphatic collectors. 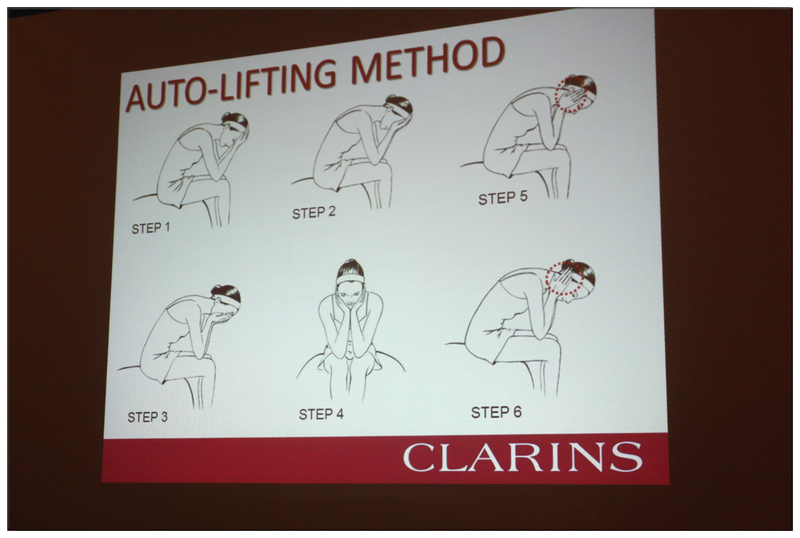 As you can see, CLARINS plant based products are able to break the protection of the fatty pockets so that those excessive fats in the fatty pockets will split up, released into our system so we can dispose those excess fat through sweating or defecation. 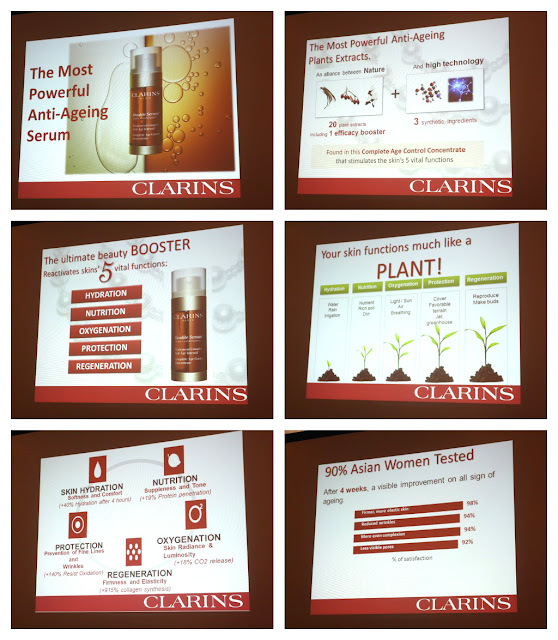 With CLARINS application method and its plant based products, you can see the results soon. And I'm gonna show you the Manual Auto-Lifting method by CLARINS which able to achieve perfect V contours from every angles. Just 2 minutes for maximum results, practice this everyday. Engineered by 27 years of plant science, this NEW double serum combines two most powerful age-defying serums into one optimum balance to fight all aspect of visible ageing. This is the only anti-ageing treatment rich in 20 types of plant extracts that revitalizes 5 skin vital functions: Hydration, Nutrition, Oxygenation, Protection and Regeneration. This double serum has tested on Asian women and 90% of them agrees that after 4 weeks of trial, there are visible improvement on all signs of ageing. Yes, we get to test the powerful double serum as well. Look at how radiant my hand had become! In fact, my hand feels softer, subtle, glowing as well, I'm amazed by how immediate I can see the effect. 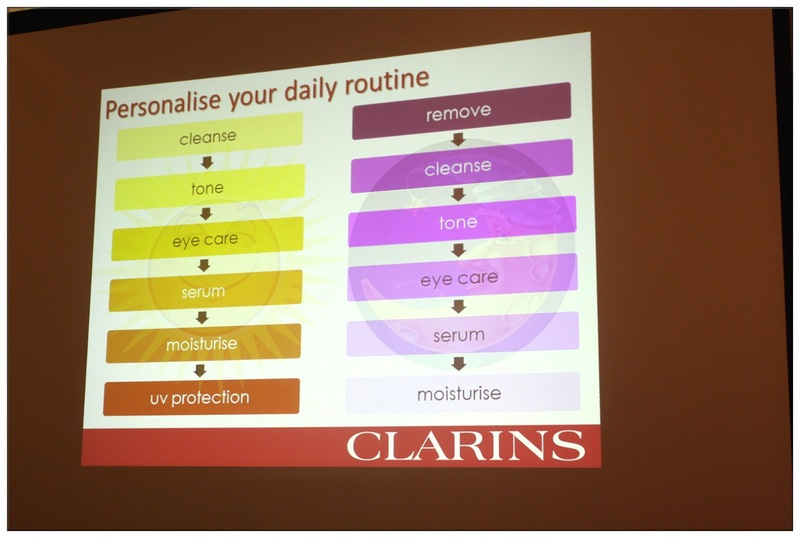 For those who are unsure what are the steps for applying skincare products, here are the guide for it. There are slightly different between the day and night routine. 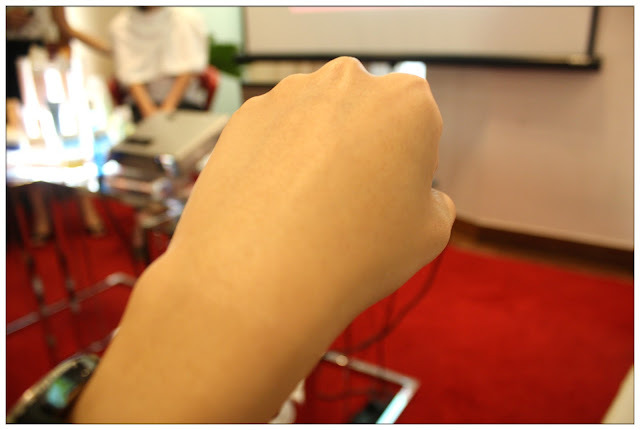 After we done testing the products on our hand, so is the demonstration on Rane ended. Let's see the result shall we? Can you see the effect? The V contours? 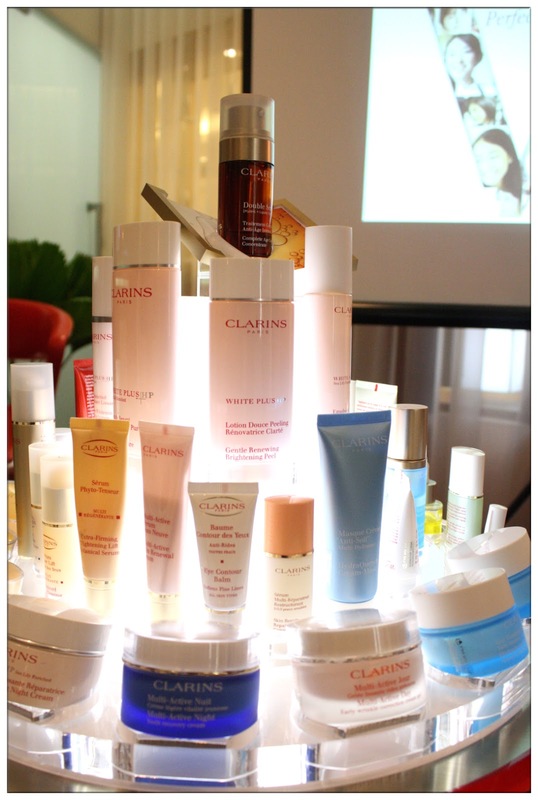 Immediately her face applied with all the CLARINS products became more 3D! 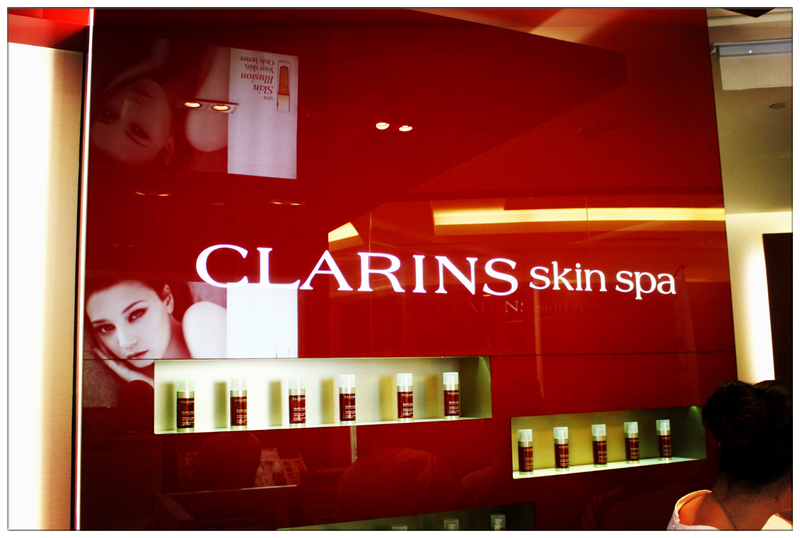 Do visit CLARINS skin spa at KLCC if you wanted to try CLARINS facial as well as body massage. They do it 100% by hands and uses 100% natural plant based products of CLARINS! Freshly brewed tea. 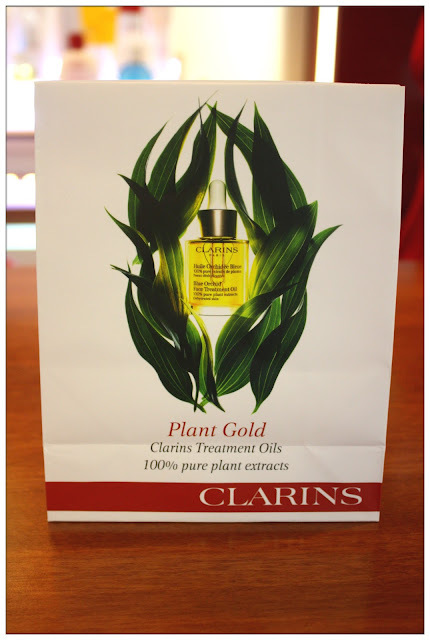 Complimentary for CLARINS clientele after treatment to flush out all the waste. 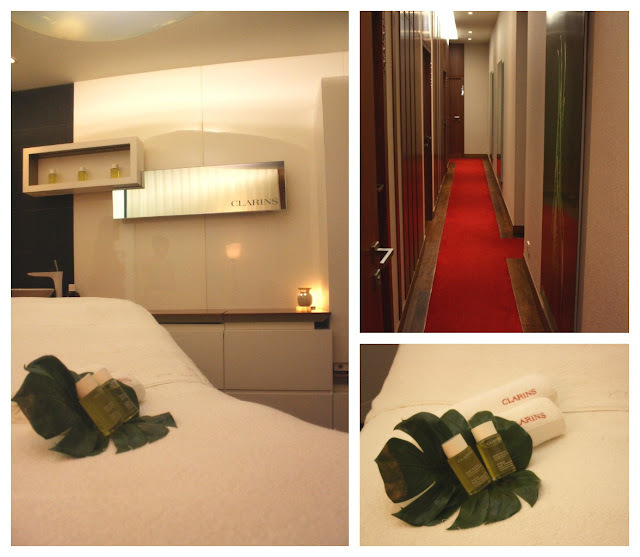 The treatment rooms at CLARINS skin spa KLCC, which recently refurbished with a new added touch and feel to the interior, for making the customers feel very much at home.